Laura Muir started 2017 with a bang last night by smashing the UK indoor record over 5,000 metres – set by Scottish track legend Liz McColgan 25 years ago – at the GAA meeting in Glasgow. The 23-year-old, in only her second-ever outing over the distance, picked up where she left off last year to produce the tenth fastest time for the event, clocking 14 minutes 49.12 seconds, despite running the closing 16 of the 25 laps unaccompanied. With only two other European women previously going quicker, it slashed an astonishing 14.05 seconds off McColgan’smark, set in Birmingham in 1992. “I am delighted to get it and it is nice to know now where I am at in terms of the 5,000m,” said Muir. “I kept looking at the times, and my coach, Andy Young, was shouting them out, but I tried not to look at the number of laps remaining. I kept my focus on three minutes per one kilometre, thinking the last one would take care of itself, and those tactics paid off. Just three Britons – Paula Radcliffe, Jo Pavey and Zola Budd – have ever run faster outdoors than the new indoor benchmark, with the Perthshire prospect thought likely to take on the distance again on the track this summer following the world championships in London. Muir, due to compete in Saturday’s Great Edinburgh International XC in the 4x1km relay, claimed Kelly Holmes’ long-standing 1,500m record last summer just weeks after finishing seventh at the Olympic Games in Rio. 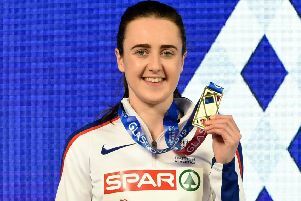 Elsewhere at the GAA meet, Muir’s training partner, Jemma Reekie, broke the Scottish junior 3,000m record while rising prospect Ben Greenwood lowered his Scottish junior 600m best to 1:18.99, missing the British mark by less than two-hundredths of a second.